Amy Sharp Schneider, standing, speaks to Hillsboro City Council and the Hillsboro Planning Commission Monday at the Highland County Justice Center. Schneider spoke on behalf of some local pet owners against a zoning code update that would limit the number of animals allowed in Hillsboro households. 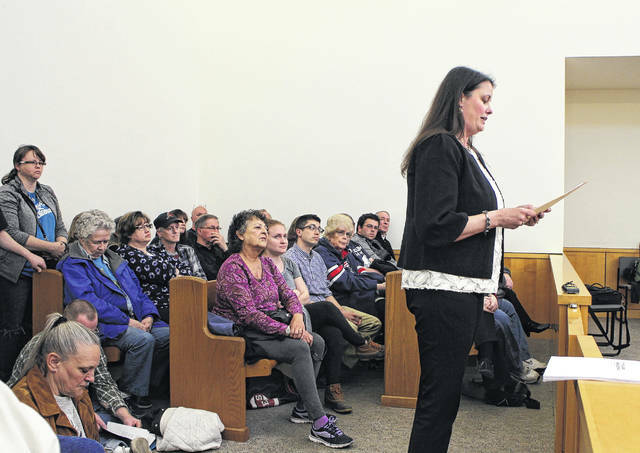 It was standing room only Monday night at the Highland County Justice Center as a crowd of pet owners and other concerned citizens packed the municipal courtroom to voice their concerns about a Hillsboro zoning code update that would limit the number of pets allowed in Hillsboro households. The gathering was a joint public hearing between the Hillsboro Planning Commission, which drafted the zoning code update, and Hillsboro City Council, which heard a first hearing on the update Monday evening. Liz Fields, a consultant who helped draft the 99-page update over the past year, said Hillsboro’s zoning code has not been updated since the 1950s. Prior to public comment, Fields gave an overview of the update and outlined various changes that were made, including sign variance policies, parking requirements and permitted land uses. As previously reported, the portion of the update that has received the most public attention thus far has been a rule that would limit the amount of pets per household to a total of four, drawing the ire of local pet owners who could be in violation of the rule if it is approved. Officials have said the rule was added so complaints against nuisance pets could be enforced, but some expressed concerns that vindictive neighbors may use the rule as a weapon against pet owners with whom they have personal disagreements. Of the several citizens who spoke at the meeting, three were representatives of local veterinary offices. Amy Sharp Schneider, who works at her family’s veterinary practice, and local vets Reid Sharp and Jennifer Lance all expressed concerns about how the provisions in the zoning code update might affect their businesses and customers. Schneider said she was shocked when she first read the pet limit rule last week. “Initially, I found it hard to believe,” she said, adding that more than half of her office’s clients have more than four pets. Lance said the rule would essentially force pet owners to choose which of their animals they want to keep if they own more than four. Lance and Sharp also expressed concerns about how the code update might affect their businesses. Sharp said despite a clause that allows buildings and land uses to remain under the old zoning code unless they are changed or left vacant for six months, he feels “uneasy” about the update. Kelton Workman, a Hillsboro resident, said responsible pet owners shouldn’t be “persecuted” because other pet owners don’t take care of their animals. “This is just so wrong,” she said. “Pets aren’t property… they’re part of our family. There are furred kids and scaled kids and feathered kids… It’s not right to limit us.” Workman said she has a wide variety of pets and gives each of them quality care. Andrea Kelch, a local 4-H club member, said the rule restricts her 4-H projects. Tom Eichinger, chairman of the Hillsboro Planning Commission, said there was supposed to be a provision in the zoning code that makes exceptions for 4-H projects, but it was accidentally not included. “Don’t tell me my family is too big,” she said. Another resident said the zoning code update erroneously labels rabbits as outside pets since he has an indoor rabbit, and expressed concerns about regulations on repairing sheds and other structures. A Highland County resident said she was considering buying property in town before the pet rule came up, but said she will not if it is approved. She, too, said the law should regulate quality of care rather than quantity of pets. “The number of animals makes no difference,” she said. At the end of the hearing, Council President Pro Tempore Justin Harsha placed the matter in the Zoning and Annexation Committee for further review. A meeting of the committee, chaired by Councilwoman Wendy Culbreath, will be announced at a later date. Council heard a first reading on the code update during its meeting later in the evening. Eichinger told The Times-Gazette after the hearing that the zoning code is a “living document,” and nothing has been set in stone. Eichinger added that zoning code updates always require adjustments and revisions before the final product is approved. Harsha said last week that the pet rule will likely be removed from the code.